As we try to understand why the body deals with pain the way it does and as we dive into the research, we discover some potentially conflicting theories to explain the mechanism of pain-generation pathways. Nerve Fibers: The body is made up of a vast network of afferent nerve fibers that bring information from the outside world to the central nervous system for interpretation. Nerve fibers are of varying diameters and have varying amounts of myelin, an insulating and protective sheath around the nerve. Because of these differences in size and insulation, the velocity that information travels from the periphery to the central nervous system is different, depending on which afferent nerve is stimulated. This means information reaches the central nervous system at different times. Pain involves many systems—the peripheral, central, and autonomic nervous systems, the structural-anatomical system, the limbic system, and the cardiovascular system, just to name a few. There are still regions of the brain we do not understand, and we do not have a definitive, all-encompassing pain model that covers all the bases. Nonetheless, here is an overview of a few of the most popular theories. Max Von Frey developed one of the earliest theories of pain in 1895: the Specificity Theory. 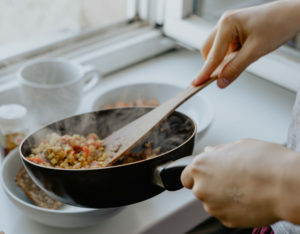 This theory states that individual pain receptors transmit signals to a specific pain center in the brain, which then sends back instructions for the appropriate motor response, such as to quickly pull a hand away from the hot pan. This theory is based on the assumption that there is a specific pain system. While the sheer simplicity of this notion is comforting, it has been disproven: There is no identifiable pain center in the brain. This theory also fails to acknowledge the psychological aspect of pain or the role that prior experience can have in making us hypersensitive to various pain stimuli. In the late 1920s and early 1930s, John Paul Nafe and Johannes Scheider suggested that there is no distinct system for sensing and responding to pain, but that pain receptors are shared with other bodily systems. In this theory, the brain only gets a pain signal if there is a specific combination and summation of stimuli formed in the spinal cord, which leads to the implementation of a preset pattern of response. One of the problems with the pattern theory is that it underestimates the role of the brain, viewing it merely as the receiver of a message from the receptors. We now know the brain plays a far more complicated and dynamic role in how the body deals with pain. Next up in our pain study is the sensory theory, which operates on the idea of gate control. The Gate Control Theory, developed by Ronald Melzack and Patrick Wall in 1965, is the idea that when you slam a finger in a door, you wrap the finger in the other hand or perhaps put it in your mouth, caress it, or do anything you can to relieve the pain. 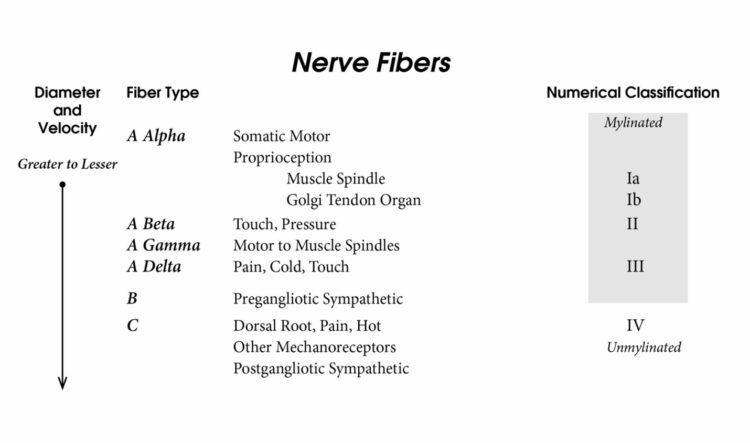 All peripheral sensations—heat, cold, touch, pain, vibration—are transmitted by peripheral nerve stimulation. This stimulation of nerves is transmitted to the spinal cord and, if significant enough, information is transmitted to the brain for processing. Pain sensation is carried by nociceptive pain fibers, also known as A-Delta and C-Fibers. These signals go to the dorsal horn of the spinal cord, stimulate a second-order neuron, and then travel via the lateral spinothalamic tract to the brain for interpretation. If we add some form of touch to the equation, we also stimulate A-Beta fibers. The touch sensation travels via A-Beta fibers to the spinal cord as well, stimulates an inhibitory interneuron in the dorsal horn, and diminishes the pain sensation that travels to the brain via the afferents stimulated by the A-Delta and C-Fibers. We feel “less” pain. This, again, is why we are quick to squeeze or caress a finger after we shut it in a door—this actually diminishes the pain sensation perceived by the brain. Gate Control Theory makes a lot of sense in many scenarios, but it does not explain those in which a nocioceptor—the sensory receptors for pain—are not stimulated and yet a person still experiences pain. That summarizes the Conditioned Pain Modulation theory, which states that pain inhibits pain. Two noxious stimuli are applied at the same time—the second in the same area, but not in the same spot as the first. The second stimulus is processed by the dorsal horn and can inhibit the first noxious stimuli. This theory holds up, and may be why when we are applying a pain-reducing technique of any sort, simply being near the area can be as effective as being on the area. Other pain theories assign an important role to localized tissue and the peripheral nerves located at the site of the pain event. In contrast, The Neuromatrix of Pain view emphasizes the role of the brain, shifting focus to components of the central nervous system (CNS). In this theory, pain is actually the output of the brain; the multiple influences on pain outside of peripheral nociceptive stimulation are important. The Neuromatrix of Pain emphasizes the brain’s decision to create a pain sensation, and diminishes the input from peripheral tissue, although it does not negate the peripheral nervous system’s part. Peripheral noxious stimulation still plays a large role in the creation of a pain sensation, but it does not provide the entire story. This theory does a much better job of explaining phantom-limb pain, fibromyalgia, NSLBP, and other chronic pain conditions where nociceptive stimulation is not present, but the sensation of pain persists. Lorimer Moseley is an influential person in pain theory, and I highly recommend his video, aptly named Pain, for an entertaining, simple overview of this highly complex topic. Moseley describes pain as holding meaning: It is personal. The pain I experience is not the pain you experience, even if we have similar nociceptive stimulation and the same diagnosis. Pain can be more psychological than physiological. For example, say we were walking on a beach and both of us stepped on something sharp. While we would both wince, I might be able to continue our walk. However, perhaps you had previously cut your foot and the cut became infected, which required a hospital stay and a two-week course of antibiotics. You might demand that I either carry you back to the car or go for help. It would be the same experience for both of us, but with a different frame of reference to interpret the stimulus of stepping on something sharp. We need to be conscious when dealing with people having the same diagnosis because they could have very different pain perceptions. 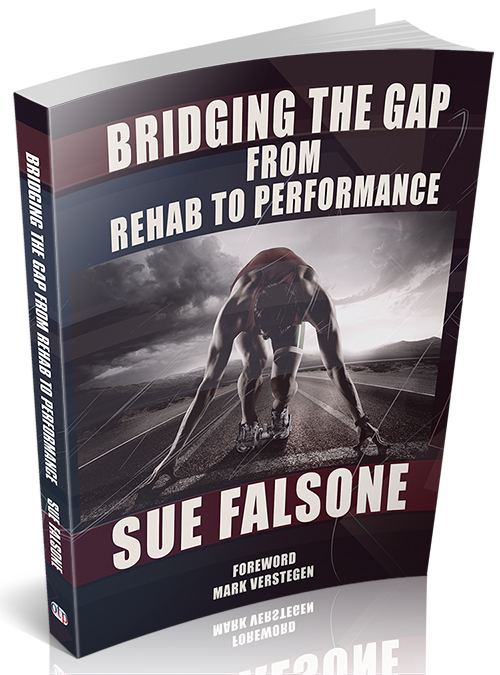 We cannot judge one person’s pain based on the objective findings of a diagnosis. Sometimes people might have a catastrophic injury and feel minimal pain, yet another might have a minor hamstring strain and be limping in severe distress. Pain is subjective and individual. We cannot assume that the same nociceptive stimulation in two people will result in the same perceived sensation or experience.